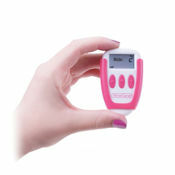 The Ova Plus uses TENS to provide effective, drug-free pain relief from period pain. Small, electrical impulses are sent through 2 electrode pads worn on the lower abdomen for long-lasting relief from period pain (Dysmenorrhoea) and secondary pain caused by endometriosis, fibroids or pelvic inflammatory disease. Measuring just 3.8cm x 6.5cm, the Ova Plus can be worn discreetly underneath clothing to provide relief wherever and whenever you need it. The Ova Plus reduces the need for pain-relieving drugs and can be used for long periods of time without any side-effects.